Winhall FD was dispatched on 9/10/2013 at 10:22 hours to 5 The Hollow Rd for what was believed to be a brush fire. Upon arrival crews discovered an underground propane tank venting and on fire. As of noon on 9/11/2013, crews are still on the scene while the product burns off. South Londonderry sent personnel, an engine and a water monitor to assist. 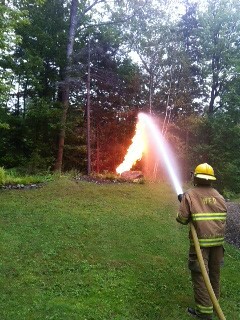 Picture provided to Fire Mutual Aid.